Saskatchewan is pleased to have another ally at the table fighting for pipelines and standing against the Trudeau carbon tax. Less than a year ago, our province was the only one in Canada standing up against the carbon tax. Today, with the election of a new government in Alberta, five provinces representing 60 per cent of Canada’s population are fighting the federal government’s carbon tax grab. When Ontario announced it would challenge the Trudeau carbon tax, they stood with Saskatchewan in our court challenge. This week Saskatchewan stood with Ontario in their fight at the Ontario Court of Appeal. 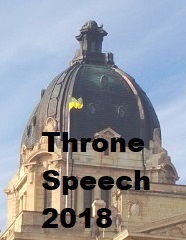 Saskatchewan made it clear that the imposition of the carbon tax is unconstitutional and should be scrapped. The Trudeau carbon tax is a poor environmental policy that doesn’t reduce emissions. It will hurt Saskatchewan families that need to drive their kids to hockey practice, heat their homes in the winter, and feed and clothe their families. It will reduce jobs and move those jobs to other areas of the world that aren't charging a carbon tax, and that, in many cases, are emitting more than we are here in this province in those industries. On the issue of a carbon tax, Ryan Meili and the NDP are out of touch with Saskatchewan. While nearly 90 per cent of Saskatchewan people have expressed that they do not support a carbon tax, the NDP Leader has said he applauds the policy. Meili recently confirmed he’s out of touch on taxation in general when he shared an article entitled “Low Taxes are Nothing to Brag About”. The article actually condemns Saskatchewan for not raising taxes. It said we shouldn’t be proud of having such low tax rates and should look to Quebec and their much higher tax rate as the way to go. Upon sharing the article, Meili could have said we should be proud of our low tax regime because lower taxes attract investment, which leads to more jobs, which leads to a better quality of life for everyone. He even could have said we want hard-working people to keep more of their money. Instead, he offered that this was an important reflection on how taxes play a role in sustaining a healthy society. On Budget Day, the NDP leader said that it was too early to discuss their plan for increased spending, lower debt, and how they would actually pay for things. However, thanks to Twitter, we’re starting to see the NDP’s true colours. They would raise your taxes, just like they did 21 times while serving in government. In contrast, our government has always worked hard to keep taxes low and affordable. This spring, our government presented a balanced budget with record spending on education and health with no new taxes and no tax increases. Your Saskatchewan Party government remains focused on important policy issues. Unfortunately, we are forced to contend with federal proposals that would damage the strong economy that allows us to provide services to the people of our province. Federal policies such as Bill C-48, Bill C-69, and the carbon tax will weaken our economic strengths which is why we will continue to stand against them. Bill C-48 is a good example of bad policy. The Oil Tanker Ban selectively targets oil coming into the west coast, making it harder to get pipelines built and disproportionately hurting provinces that need to get oil to international markets. Yet, importing large tankers of foreign oil off the St. Lawrence in Quebec is OK.
Bill C-69 will not accomplish its stated goals of streamlining or efficiency in getting resource projects built. The current project approval system isn’t broken. The only thing that is broken is the political will to see our energy sector flourish and move forward. We cannot afford to submit these sectors to further uncertainty and delay. Good news for our economy came this week when it was announced that the Port Raymond Border Crossing will be restoring its 24-hour schedule as of April 23rd. The U.S. Customs and Border Protection previously made the decision to cut the hours of operation to four border crossings at Port Raymond, Morgan, Scobey and Opheim. The Port Raymond Border Crossing is utilized, not only by Montana residents, but Saskatchewan residents on a daily basis. The Government of Saskatchewan sent strong representation to four town hall meetings in Plentywood, Scobey, Glasgow, and Malta in support for both Saskatchewan and Montana residents who rely on Port Raymond, for commerce and trade. The province of Saskatchewan exports more goods and services to the U.S. than to any other country. In 2018 alone, Saskatchewan exported $1.3 billion dollars of product to Montana out of the $17.3 billion Saskatchewan exported to the United States. Cutting access to the international border, by any amount, would have had substantial impact on our trade activity, which is why we are pleased with this announcement. Our government will continue to stand up for Saskatchewan to grow our economy, sustain needed supports for individuals and families, and to provide opportunity so that Saskatchewan people can stay in our province, start their careers, and build a life. If you have a question about this Legislative Report or any other matter, just Contact Lyle.